I love asian food but I don’t cook a lot of it. Sash has the whole stir fry thing covered and he’s great with thai flavours. Recently though I’ve been interested in learning more about different styles of chinese cooking. I’d like to make some fresh and interesting things steering clear of sweet and sour pork and black bean sauce if you know what I mean. 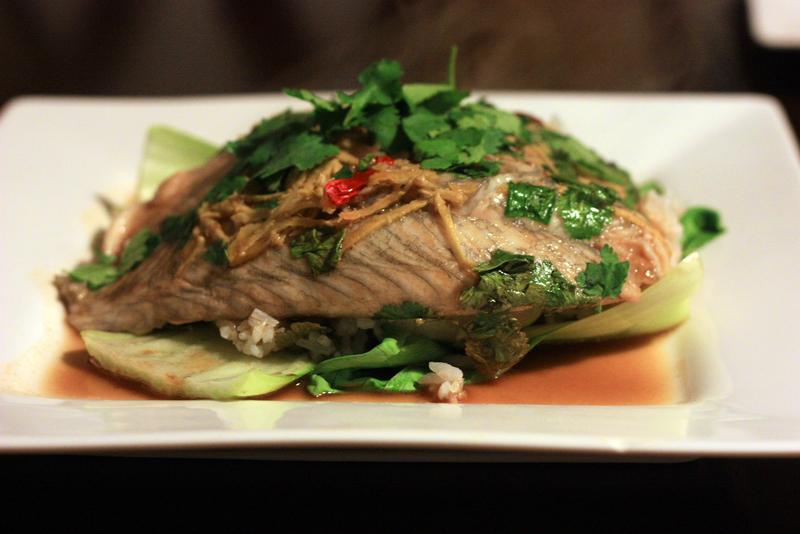 So, my first attempt was a chinese influenced steam/baked barramundi fillet with choy sum. In a baking dish I put two barramuni fillets, sherry, half the coriander, chilli, ginger and shallots. Seal the top of the baking dish well so the fish steams in the oven for about 15 minutes on about 200ºC. Remove from oven and put in choy sum and place back in oven for about 5 minutes so the vegetables can steam as the fish finishes cooking. Remove from oven and drizzle with mixture of soy sauce and sesame oil. Heat peanut oil in a small saucepan until smoking point then drizzle over the top. Serve by placing the vegetables down first then the rice then the fish on top garnishing with extra coriander and pan juices. This was quick, easy and really delicious. Sasha gave it a 9 out of 10. I think he’s biased but it was pretty good for a first attempt and will definitely make again. Next Post OMG STEAK AND CHIPS SO YUM!